Have you ever lent your buddy $5 and then never get paid back? Yeah, me too (I am talking to you Sean). Believe it or not, for professional services companies such as law firms, architects, engineers, and CPAs, purchasing a new copier—or worse yet—a fleet of copiers, is very similar. You spend a significant amount of money on something that you will never get back. It’s the cost of doing business of course; however, you should do everything you can to make sure you are lending that friend the least amount of money needed. We don’t sell copiers or printers, but we do consider ourselves experts in the document services industry that includes copy, print, and scan functions (processes as they are handled inside of our client’s offices). We are often called upon to do an analysis of a company’s process, staffing, and equipment costs and, frankly, what we often see scares us. Every copier has color copy/print capability. Sure, it’s great to be able to easily print the pictures you took from last week’s family vacation and grab them off the copier, but generally speaking, color copiers should be strategically placed and limited to a few areas in the office. Color copiers are about double the cost of a black and white copier. For example, let’s assume you have four color copiers in the office that each cost $15,000. That’s $60,000. If you took a step back and purchased two black and white machines and two color machines instead, you could very easily save over $10,000. Would you be willing to walk up the hall to a color copier in exchange for $10,000? I know I would. Every copier has color copy/print capability. Yes, the second mistake is the same as the first. Intentionally. Beside the large cost difference between color and black and white capability, there is the service cost. If your copiers can print in color, they will generally do so every chance they get. Print that email with the website link that comes out in blue? Have a memo template with a tiny bit of color? That’s going to cost you just as much as a full color presentation. Once you realize that the difference in service cost for a black and white copy and a color copy is generally ten times or more, you’ll understand why someone that sells copiers will be more than happy to sell you color capabilities everywhere. It’s not bad enough that the machine costs more, the service will really get you. There are too many copiers, and they’re too fast. Our business is to run high-volume production facilities and when we walk around our clients’ offices and they have equipment that is almost as fast as our equipment, we cringe. When we look at the low monthly volumes on those same machines, we start to tear up. Our clients are being oversold. Before you buy any equipment, do a full analysis of volumes and equipment and right size the machines. Get a second opinion. Allow more than one company to tell you what they believe you need and why. As soon as they know you are shopping, they go from a full fleet of high speed color equipment to a mixed fleet of appropriately sized equipment in a hurry. Speed matters. So does thousands of dollars. Copiers have the wrong lease. A 3-year lease versus a 5-year lease is appropriate in certain scenarios, but the reasons should be legit—and not that someone will want to come back and sell you new equipment again 2 years sooner. Make no mistake—one way or another you are going to pay for that entire copier. But if the equipment should last 5 years, then why would you want to pay for it in 3 years? Now let’s figure out how to have Sean pay you back that $5. In addition to the things to avoid when it comes to copiers, there’s one thing to get on board with: cost recovery. Research shows that over 70% of law firms and architects recover the expenses and reimbursables for photocopies, scanning, plotting, etc. There are several great technologies that can be used to automate recovery of these costs. Those technology companies have been around for a long time, and they’re growing…hint hint…more and more companies are taking advantage of the ability to recover the direct case and project expenses including document services. Check out our Case Study to see how we helped a law firm save thousands each month. How do we know all this? 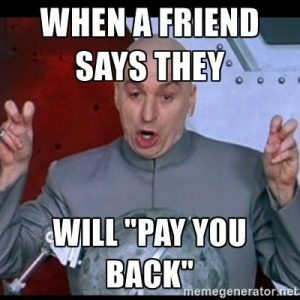 We are often asked by our clients to perform a free office services analysis to better understand how they may reduce costs, operate more efficiently, and, in many cases, get their buddy to pay them back the $5 they gave them. Interested in how we can help? Call us to discuss.